Benoy, the global studio of Architects, Masterplanners, Interior and Graphic Designers, is excited to announce its appointment to the Xuhui Vanke Center in Shanghai. 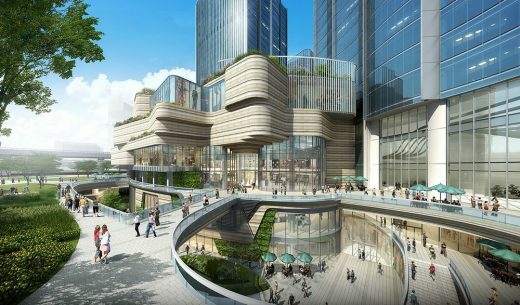 This is developer Vanke’s first large-scale commercial real estate project with a mixed-use programme in the city. Benoy has won a multi-disciplinary scope which includes Tower and Retail Architecture, Retail and Office Interior Design and Graphic Design. The landmark development sits at a prime location adjacent to the Shanghai South Railway Station; the city’s second most prominent station after the Shanghai Railway Station. The overall scheme is being developed over three phases with Benoy as the Chief Architect delivering the final phase alongside Skidmore, Owings & Merill LLP (SOM). Connecting six commercial blocks, the scheme aims to create a new urban complex set within a 70,000m2 landscaped realm. The three phases are connected by a mile-long green valley which runs diagonally across the site. The wider development’s twelve buildings overlook and interact with the urban parkland which essentially brings a green streetscape experience into the heart of the development. The green belt begins at the Shanghai South Railway Station edge and continues through to a museum and arts complex which anchors the journey. “The green spine gave us the opportunity to bring a streetscape and smaller-scale environment to the commercial complex, and physically and visually unite Phase III with the earlier phases. We transformed the commercial components by blending the parkland into the Architecture and Interior Design,” said Ferdinand. Mimicking the forms of the rolling landscape, the 100,000m2 multi-level retail podium is a network of interconnected buildings. The podium has been fragmented into a collection of curved individual blocks, each carved out to create unique spaces for Retail, Food and Beverage, Leisure and Arts tenants. The result is an undulating internal streetscape which blends public and commercial spaces, landscape and building, culture and business. Sitting above the podium are the four Grade A commercial office towers. Benoy is delivering the set of twin towers which will reach to 120m in height. SOM will deliver the other two towers within the final phase. The architectural design melds with the landscape once again, impressing open-air sky gardens, which overlook the public park, into the buildings. The forms and language of the towers are a vertical extension of the podium below. Transport is perhaps the driving force behind the development, ensuring convenience and longevity. The development seamlessly integrates underground to the Shanghai South Railway Station’s two-line metro station and three rail lines. The final phase of the development has commenced construction and is due to complete by 2019. Benoy established its Shanghai Studio in 2008 and has since grown an acclaimed portfolio in the city which includes built schemes such as the Shanghai ifc mall, Shanghai ICC and iAPM and Jing An Kerry Center. 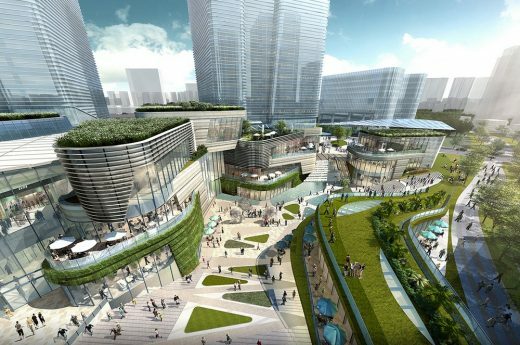 The firm is also looking to the future with schemes such as Qian Tan Office Park, Mango West Bund Plaza and the Lujiazui Pudong Qian Tan Masterplan.